The Occupation of a Personal Trainer! My visit at PIE RANCH!! Getting connected to the EKG sensor was AWESOME! Learning about the different components of an EKG line was AWESOME! This lab was AWESOME! The purpose of doing an EKG lab was to show us what an abnormal heartbeat looks like, and what normal heartbeat looks like. It showed us that there can be problems if one of the five components of a heartbeat is missing, or does not look normal. We also did this to give us insight on how the pattern of a heartbeat can change when one is having heart attack! The steps of this lab were actually a lot more simple than I thought they were going to be. 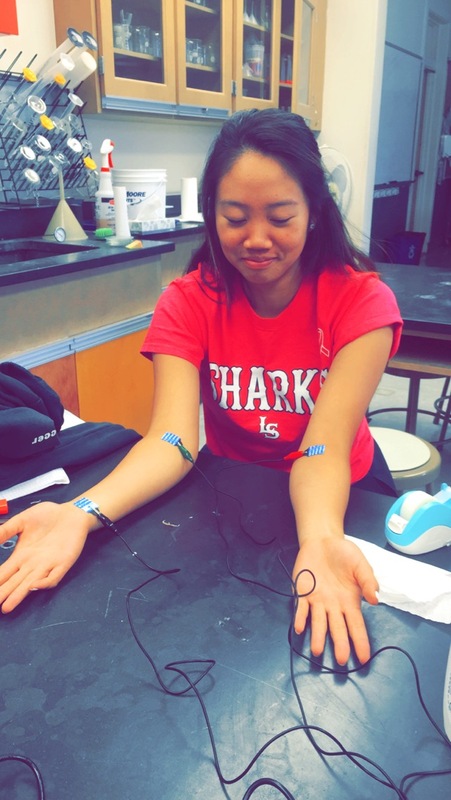 We used an online application called LabQuest, and used a Vernier EKG sensor with electrode tabs. Since I was connected to the sensor, I had to stick electrode tabs on my arms, and I had to make sure they were stuck onto my arm, so the sensor would show clear results (these were very stuck to my arms, so it hurt to pull them off). The lab would actually show us a clear line, and what my heart beat looked like. It also gave a clear representation of the P,Q,R, and T waves of the pattern. My EKG line looked abnormal, but my teacher convinced us it just a technology error (Whew!). We also switched the electrodes to trick the application to show what the EKG line would look like if I were to have a heart attack! Here we could locate the different components of the line. Although there was a technology error, we could still locate the different waves. By switching the green and red electrodes, the results looked very abnormal, with all the components being absent, or abnormal. Seeing the results from the normal heartbeat and comparing them to the one where I was having a “heart attack,’ made it clear that a heartbeat of a person with a heart attack is nowhere near normal. The P,Q,R, and T components are either absent or abnormal. The T wave (the biggest wave) has the most obvious change. Although there was an error, we could still see the different changes and comparisons from a regular EKG line to an extremely abnormal EKG line. Previous Previous post: I HEART Sports Med! Sportsmedzone by Olivia Geronimo is licensed under a Creative Commons Attribution 4.0 International License.Based on a work at sportsmedzone.wordpress.com.Permissions beyond the scope of this license may be available at sportsmedzone.wordpress.com.